This event has been canceled. We are sorry for the inconvenience. 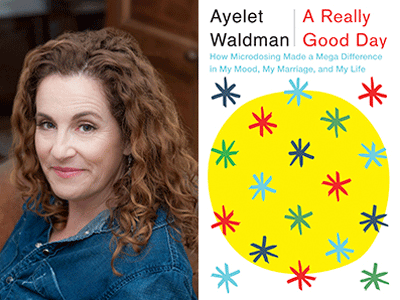 Author of "A Really Good Day"
Ayelet Waldman is the author of A Really Good Day: How Microdosing Made a Mega Difference in My Mood, My Marriage, and My Life. The book is a revealing, courageous, fascinating and funny account of her experiment with microdoses of LSD in an effort to treat a debilitating mood disorder, of her quest to understand a misunderstood drug, and her search for a really good day. When a small vial arrives in her mailbox from "Lewis Carroll," Ayelet Waldman is at a low point. Her mood storms have become intolerably severe, she has tried nearly every medication possible, her husband and children are suffering with her. So she opens the vial, places two drops on her tongue, and joins the ranks of an underground, but increasingly vocal group of scientists and civilians successfully using therapeutic microdoses of LSD. As Waldman charts her experience over the course of a month—bursts of productivity, sleepless nights, a newfound sense of equanimity—she also explores the history and mythology of LSD, the cutting-edge research into the drug, and the byzantine policies that control it. Drawing on her experience as a federal public defender, the mother of teenagers and her research into the therapeutic value of psychedelics, Waldman has produced a book that is eye-opening, often hilarious and utterly enthralling. Waldman is also the author of the novels Love and Treasure, Red Hook Road, Love and Other Impossible Pursuits, and Daughter's Keeper, as well as of the essay collection Bad Mother: A Chronicle of Maternal Crimes, Minor Calamities, and Occasional Moments of Grace and the Mommy-Track Mysteryseries. She is the editor of Inside This Place, Not of It: Narratives from Women's Prisons and of the forthcoming Kingdom of Olives and Ash: Writers Confront the Occupation. Ayelet was a federal public defender and an adjunct professor at the UC Berkeley law school where she developed and taught a course on the legal implications of the War on Drugs. She lives in Berkeley, California with her husband, Michael Chabon, and their four children.